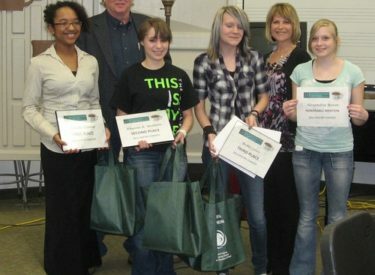 Winners of an area-wide high school poetry contest read their poems for a crowd of around 80 people Thursday evening at the Poetry Coffee House, hosted by Seward County Community College/Area Technical School. First place went to Ananda Coleman, age 16 and a Liberal High School sophomore, for her poem “Cascade.” She was awarded a $100 SCCC/ATS scholarship, a $25 Spencer Browne’s gift card, $25 cash, “The Poet” Magnetic Poetry set, a USB Tangle hub, and other prizes. Second prize went to Khannah K. Wetmore, age 14 and a Dodge City High School freshman, for “Mellophone Boy.” Wetmore received a $100 SCCC/ATS scholarship, a $10 Spencer Browne’s gift card, $15 cash, “The Poet” Magnetic Poetry set, a USB Tangle hub, and other prizes. Winning third for her poem “Ignorance,” was Robbi Lewis, 15 and a freshman at LHS. She won a $5 Spencer Browne’s gift card, $15 cash, “The Poet” Magnetic Poetry set, a writer’s journal, a USB Tangle hub, and other prizes. The contest drew 30 entries from Liberal, Dodge City, Hugoton, Turpin, Okla., and Beaver, Okla. The Coffee House also showcased eight SCCC/ATS students reading their original poetry, along with SCCC/ATS English instructors Bill McGlothing and Janice Northerns. Readers from SCCC/ATS included Nancy Baez, Hugoton; Gwen Friesen, Moscow; Samantha Gillespie, Liberal; Dana Loewen, Meade; Kirsten Morris, Ulysses; Alexander Olinger, Hugoton; Jose Rodriguez, Liberal; and Caitlin Workman, Liberal. Bill McGlothing, SCCC/ATS English instructor and emcee for the evening, pronounced the event a success. This was the second year for the Poetry Coffee House, and organizers plan to make it an annual event. Poems by many of the SCCC/ATS students who read at Thursday’s Coffee House will appear in the upcoming edition of Telolith, the school’s award-winning creative writing/art journal. The new issue is slated for publication in early May, and a reception will be held on campus to celebrate its release and honor the contributors. A date for the reception, which is open to the public, will be announced later.